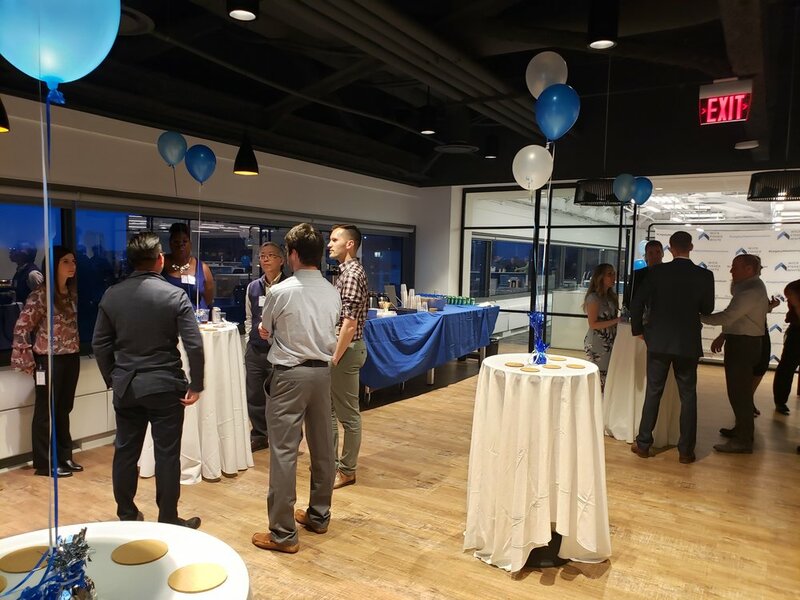 On Thursday April 4th, Wick Fisher White clients, colleagues and friends gathered for an unforgettable night to celebrate their new home at the Federal Reserve Bank Building. The new office on the fifth floor, faces east and overlooks Independence Mall and the Benjamin Franklin Bridge. Guests enjoyed the view and the new space as they mix and mingled over drinks and hors d’oeuvres. The move comes after a transitional year in 2018 which also included a company-wide re-brand to strategically reposition the firm for growth. Legacy Meets Innovation was the theme as the firm embraces their 118-year history, while looking ahead to future of engineering design. The new re-imagined space was designed to align with the company’s corporate culture of open communication and commitment to continuous improvement. The open office layout along with the brightened-up interior, sit-to-stand desks and spacious cafe’ were just a few elements that enhanced the company’s environment and culture.